Phryne Fisher is bored. Life appears to be too easy, too perfect. Her household is ordered, her love life is pleasant, the weather is fine. And then a man from her past arrives at the door. It is Alan Lee from the carnival. Alan and his friends want her to investigate strange happenings at Farrells Circus, where animals have been poisoned and ropes sabotaged. 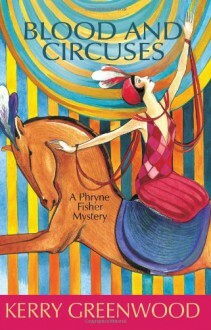 Mr. Christopher has been found with his throat cut in Mrs. Witherspoons irreproachable boarding house and Miss Parkes, an ex-performer, is charged with his murder.Phryne must go undercover deeper than ever to solve the circus malaise. She must abandon her name, her title, her protection, her comforteven her clothes. She must fall off a horse twice a day until she can stay on. She must sleep in a girls tent and dine on mutton stew. And she must find some allies.Meanwhile, in Melbourne, the young and fresh-faced policeman Tommy Harris has to solve his own mysteries with the help of the foul-spoken harridan Lizard Elsie, or Miss Parkes will certainly hang. Can Phyrne uncover the truth without losing her life? Another excellent adventure with Phryne. It was easy to see from the beginning that certain things would be connected n the book, but it was still a fun romp through a circus.